The Bureau of Indian Affairs has abruptly ended funding for the tribe's range rider program, according to Barnes. The Trump administration has cancelled funding for the Blackfeet Nation’s range rider program. These are tribal members who inspect cattle and make sure the land isn’t overgrazed. Now they could potentially lose their jobs and the Blackfeet tribal council isn’t pleased. Sitting in his office in Browning, Blackfeet tribal chairman Harry Barnes looks angry. “I believe it’s illegal,” he says. The Bureau of Indian Affairs stopped funding the tribe’s range rider program on October 5th. Barnes says the move means those range riders and support staff could lose their jobs on the reservation. And when jobs are at stake, he says the federal government -- by law -- has to consult with a tribe before it makes a decision. But that didn’t happen. That 3 percent Barnes is talking about is a fee the BIA collects from ranchers leasing land on the reservation. The agency then transferred that money to the tribe, who used it to fund the range rider program. It costs about $142,000 a year, according to a 2014 budget. 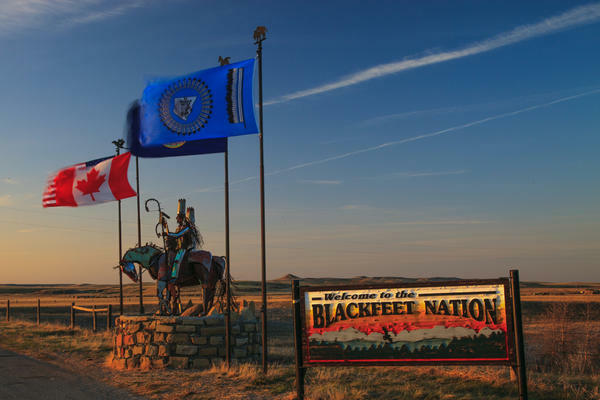 But early last month, the BIA sent a letter to the Blackfeet tribal business council saying it would stop transferring that money to the tribe. Barnes says that effectively ends the range rider program. Any future fees, the letter says, will now go to the federal government. The letter doesn’t say why the BIA cancelled the agreement. Representatives from the agency did not respond to our interview requests before deadline. Barnes speculates the BIA is pocketing any future fees to help stave off an almost 11 percent budget cut at the agency. According to Barnes, the tribal council sent Interior Secretary Ryan Zinke a letter asking him to review the decision. Zinke’s spokesperson, Heather Swift, was unable to comment before deadline. In celebration of the opening of Going-to-the-Sun Road in Glacier National Park this week, members of the Blackfeet Tribe held an honoring ceremony. Amid the peaks of the Continental Divide, Blackfeet men in full regalia sang an honoring song for Francis X. Guardipee, the first Blackfeet tribal member to serve as a National Park Ranger. The United States Department of the Interior has announced a negotiated settlement with an energy company that cancels 15 of the remaining oil and gas leases in the Badger-Two Medicine area just east of Glacier National Park. The Blackfeet tribal government says it plans to release buffalo onto national forest land as “free roaming wildlife.” The Council made that official proclamation Thursday. The Blackfeet Tribal Business Council has voted to redraft the tribe's constitution.